Meeting in Altafulla, Spain, are (top row, left to right): Juan Pons, Frans Lettestrom, Jorge Sanchez, and Jacobo Vilella; (bottom row, left to right): Martín Garrido, Francesc Borrulli Bori, Nicolà Coratella, and Emili Xaus. 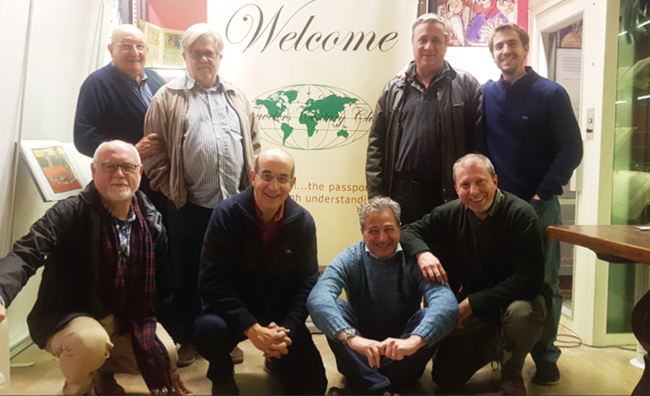 TCC members and other travelers met at the Mediterranean chapter headqua ters in Altafulla, Spain, for a discussion of Jorge Sanchez’s trip along the Yenisey River and its Arctic villages in Russia. Oscar Cadiach spoke of his adventure to South America’s Aconcagua. We are proud to announce that several people have expressed interest in joining our chapter. We are growing! Our next scheduled meeting will be on March 30 starting at 6 p.m. in our clubhouse outside Barcelona (Forn del Senyor, Altafulla). We welcome TCC members from other chapters. Just email flettenstrom@aol.com. As usual our cook Xavier will prepare the food and select the wines. Welcome!